Contemporary pan-African and feminist analysis. amaBooks holds a lot of significance for me, personally, as the first publisher to accept my work aged 22. Every time Jane Morris (amaBooks co-founder) and I meet, the exchanges are effervescent and full of laughter. Here, I interview her ahead of the currently ongoing Caine Prize for African Writing Workshop. Read an article about the workshop here. Fungai Machirori (FM): How is business in the publishing sector lately? What factors are influencing this? Jane Morris (JM): Our impression is that the general economy of Zimbabwe is in a poor state at the moment, and obviously the book industry is affected by this. People having less disposable income results in less money being spent on buying books. Unfortunately reading, outside school or college syllabi, is not a priority for many people in Zimbabwe. ’amaBooks are publishers of Zimbabwe fiction and there is a very small market for most fiction titles. However, there are positives – success stories such as NoViolet Bulawayo’s (We Need New Names)or Bryony Rheam’s (This September Sun) have stimulated an interest in local literature, and the availability of short-run printing in the region means we can continue to make books available even if their sales are fairly limited. FM: Are you receiving manuscripts? Are they good? Do you have the capacity to publish? JM: We are receiving manuscripts, and some are of a good standard. Unfortunately with the limited sales for fiction we have to be very selective in what we choose to publish. There have been occasions when we have enjoyed a manuscript and would have liked to accept it for publication but did not have the requisite resources at that time. However, the publishing world is changing. Publishing used to depend on litho printing, which required a large print-run in order to keep unit costs low – hence a large initial investment. New technology has helped in that respect; a smaller print-run is now possible, meaning that publishers can take a chance on books that are not likely to sell in big numbers, including fiction and poetry. e-books add another dimension, with that, and print-on-demand, books can remain in circulation even when numbers selling are small. FM: Are you selling many copies locally, and why or why not? Are all the books nationally available? We are endeavouring to enter into co-publishing, or rights selling, arrangements to make our titles more readily available outside Zimbabwe. Most of our books are available outside of Zimbabwe, on a print-on-demand basis through African Books Collective. FM: You have turned some books into e-books. Are they being bought? Why do you think this is the case? What are you most popular titles currently? Most of our books are available as e-books on a number of platforms. Outside of Zimbabwe, e-books do seem a good proposition cost-wise for our fiction titles, given the high cost of distribution or the high cost of print-on-demand. Certainly, e-books sales are on the increase, we have been heartened at some of the recent sales figures. It has also been good to be able to bring some of our older titles back as e-books. The good news locally is that a local company, Open Book, will soon be up and running, selling e-books both for the standard e-readers and for cell phones that do not need to be too smart. The option to sell either complete books and individual stories or poems is very exciting and innovative. Worldreader are working in a similar way to promote a reading culture, distributing Kindles in projects in schools and elsewhere across Africa. Worldreader recently launched in Zimbabwe at King George VI School for Children living with Physical Disabilities in Bulawayo, and we are just about to publish a collection of stories and poems by the students there, which will be available as an e-book. The most successful e-book title we’ve had is Bryony Rheam’s This September Sun, which topped sales on Amazon in the United Kingdom in mid-2013 and remains consistently in the top 100 of Women’s Literary Fiction. FM: You just translated ‘Where To Now’ into Ndebele? How easy/ hard was it to get backing for this? How do you intend to distribute this version? 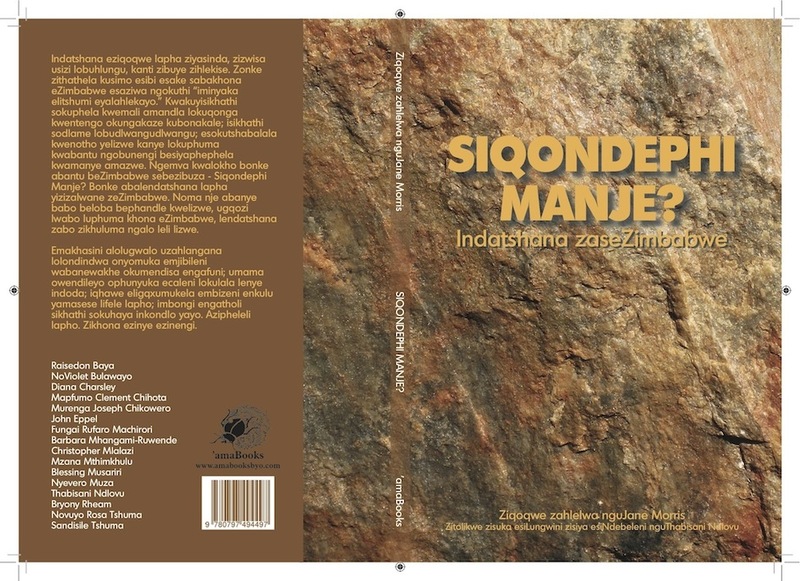 JM: We have been encouraged to take the step of publishing in isiNdebele by many writers and academics and we hope that the publication of Siqondephi Manje? will lead to a greater interest in reading literature for pleasure. The emphasis of publishing in indigenous languages again seems to have been on the school market. Literary translation is a highly skilled activity and we’ve been fortunate in having Dr Thabisani Ndlovu, who is a well-regarded creative writer and academic, to translate the work. Feedback from the writers in the collection about the standard of the translation has been very positive. The funding for the translation was part of a wider project supporting literature in Zimbabwe. We will distribute the book through our usual outlets, and we hope that local libraries will show an interest in the anthology. FM: Has the partnership with the Caine Prize in co-publishing the Caine Prize Anthology boosted your profile and profitability? JM: We are delighted to be the publishers of the Caine Prize anthology in Zimbabwe – we have always been enthusiastic about partnerships across Africa. We wanted to bring some of the best writers from the continent to the attention of Zimbabwean readers and this seemed an ideal opportunity. We would also like our books to be more readily available in other African countries and are pursuing this possibility through selling rights. Publishing the Caine Prize anthology does raise our profile across the continent, though, with the economic situation in Zimbabwe, sales of such collections are limited. FM: There are prolific writers of fiction in Zimbabwe but most are published first outside of Zimbabwe. Why do you think this is? And how easy/ hard is it to get local publishing rights? JM: Certainly many of the best-selling fiction writers outside of Zimbabwe are those that are published outside of the country – not surprisingly given the promotion by their international publishers, and given the exodus of so many of the educated population and the writing community. The most prolific Zimbabwean writers are those who tend to be published within the country – John Eppel, Christopher Mlalazi and Shimmer Chinodya spring to mind. With dollarization, it is becoming easier to bring titles from outside the country to Zimbabwean readers, but the situation again means low numbers sold. FM: What are your hopes for Zimbabwe’s literary sector? JM: These are exciting times for publishing across the world – with technological changes leading to much more open and varied access to publishing. Zimbabwe has special challenges, due to the economic climate, and to the exodus of many of those who write and who would purchase literary fiction. e-book technology does seem to offer a way of distributing content at fairly low cost to potential readers, but we must ensure that there remains a vibrant local publishing industry that provides high quality local literary content. There are good Zimbabwe writers, both in Zimbabwe and in the diaspora, and we think that the future is safe in their hands. We have always been keen to publish new writers and the ideal platform has been the series of short writings we have published. A number of these writers have gone on to publish their own books – Novuyo Rosa Tshuma, Bryony Rheam, Christopher Mlalazi, Mzana Mthimkhulu, Raisedon Baya, Deon Marcus and we understand that a number of others are working on books. We hope that this gives encouragement to new writers following on. It is really exciting as a publisher when a manuscript from a new writer appears on your screen, and you think … Yes. Initiatives to encourage writing, such as the Yvonne Vera Award and the Writers International Network Zimbabwe manuscript assessment programme are initiatives that support and encourage writing and there is certainly the need for more of these. Great interview, gives lots of insight on the Zimbabwean literary plane. Thank you! Some of my favourite things.